You’ve heard the traditional advice to lose weight and improve your appearance over and over again: diet and exercise. Diet and exercise, the cure all that does not always cure all. No matter how much you diet, or how much time you put in at the gym, you almost definitely have parts of your body that don’t look the way you want them too. Maybe it’s just one small pocket of fat, but for whatever reason, you can’t manage to lose it. Now, there’s a solution: CoolSculpting. CoolSculpting removes fat easily, naturally, and painlessly. CoolSculpting uses your body’s natural processes to destroy and remove fat cells in targeted areas with no negative effects on surrounding cells and tissues. Cells in your body are naturally destroyed when they are exposed to extremely cold temperatures. CoolSculpting takes advantage of this natural bodily function by specifically targeting fat cells and exposing them to freezing temperatures. The procedure kills the cells quickly and easily. The entire treatment takes just one hour. For 3-4 months after treatment, your body will naturally absorb the dead fat cells and eliminate them via your natural metabolic process. All the while, all of the surrounding tissues and cells remain unharmed and function 100% as normal. There’s no needles involved. CoolSculpting is completely non-invasive. There is no cutting, needles, or pain of any kind. If needles make you uncomfortable, or you want to go completely pain free, CoolSculpting is a good option for you. No surgery is required. CoolSculpting is a fully non-surgical option. Treatment is performed completely on the exterior of your skin. Best of all, you will not need anesthesia, or any other medications to get through the procedure. No downtime involved. If you can’t miss work, CoolSculpting takes just one hour and you can return to work immediately after. In fact, feel free to go right to the gym after the procedure. There are no post treatment restrictions, and you’ll leave feeling refreshed and renewed. In fact, most people are so comfortable during the procedure that they work, read, or nap during their hour with us. It’s FDA cleared. 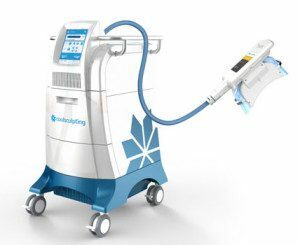 The new technology behind CoolSculpting has been FDA approved and is completely safe for use. It’s safe and clinically proven. CoolSculpting can be used safely and effectively. With just one session, you will see an average reduction of 25% of fat from the treated area. If you are not satisfied after the first treatment, it’s safe to receive the treatment again just two months after your first visit. For more information, visit our CoolSculpting page! What’s new? Our first ever application! We’ve been inspired to provide you with a little something extra. With our new application, you can have all of the information you’re looking for in one place. The application can be downloaded for free on iTunes (iPhone and iPad compatible) and Google Play (Android compatible). You’ll be able to access our videos, news, Facebook, Twitter, Instagram, forms, and contact information. Additionally, you’ll have access to any specials or promotions that we are running. In this video blog, Dr. Douglas Steinbrech discusses a huge boom in male esthetic and plastic surgery. Men are doing surgery for job related reasons, to stay looking younger and more attractive. Watch this video as Dr. Steinbrech talks about some of the popular cosmetic and surgery procedures for men in NYC. While diet and exercise definitely improve your health and body, at times, there are certain parts of the body that don’t look the way you prefer. Men who are seeking muscular and sculpted contour in their chest are ideal candidates for pec implants. 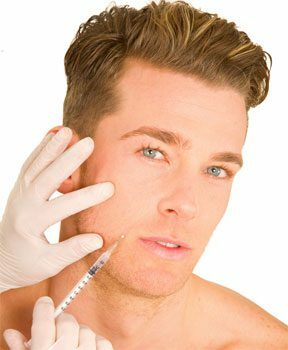 According to the American Society for Aesthetic Plastic surgery, over 225,000 Botox treatments were performed on men last year. It’s no secret that men, more than ever, are seeking Botox treatment. By blocking nerve impulses, Botox relaxes the contraction of muscles to eliminate facial lines and wrinkles. But that’s not the only thing men are getting Botox for. Botox also treats a condition called hyperhidrosis, also known as excessive sweating. A professional man, in the workplace, does not want to have sweaty palms when shaking on a business deal. It can also be embarrassing to have sweaty underarms with odor. Botox works to remedy the effects of aging, and to give people with hyperhidrosis confidence to go about their day sweat free. In a highly competitive job market, it doesn’t hurt to be ahead with a refreshed and youthful appearance. In fact, men who have had Botox injections feel that they not only look better, but feel better too. To learn more about Botox and other dermal fillers in NYC, please click here. 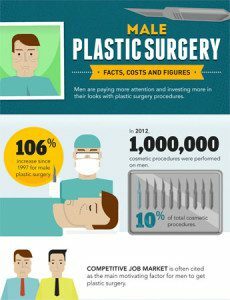 In a recently released infographic Dr. Steinbrech of Men’s Plastic Surgery Manhattan revealed that Male Plastic Surgery is as popular as ever today. 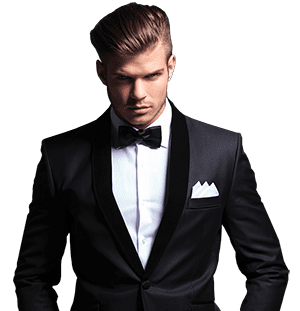 Apart from the 106% increase in the last 2 decades, statistics have shown that more than 1,000,000 male individuals received cosmetic surgical procedures.